One of the themes that has been driving press reports about the looming government shutdown is an erroneous "fact" that the Deferred Action for Childhood Arrivals (DACA) program is facing a March 5, 2018 deadline. The fact is, in Washington, D.C., six weeks is a lifetime. Legislation could easily be drafted, be referred committee, go through regular order, be sent to the floors of the respective houses and voted on, and be sent to the president in much less time. Of course, March 5, 2018, is not a deadline for the end of DACA beneficiaries. In fact, if I am correct, the program likely will not even begin to wind down for months yet. 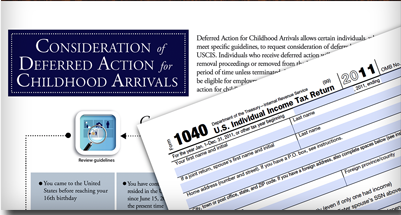 For the foregoing reasons, defendants ARE HEREBY ORDERED AND ENJOINED, pending final judgment herein or other order, to maintain the DACA program on a nationwide basis on the same terms and conditions as were in effect before the rescission on September 5, 2017, including allowing DACA enrollees to renew their enrollments, with the exceptions (1) that new applications from applicants who have never before received deferred action need not be processed; (2) that the advance parole feature need not be continued for the time being for anyone; and (3) that defendants may take administrative steps to make sure fair discretion is exercised on an individualized basis for each renewal application. Nor did the administration slow-walk implementation of Judge Alsup's order. In fact, four days after the issuance of that order, U.S. Citizenship and Immigration Services (USCIS) issued new guidance in accordance with it. As USCIS interprets that order, Judge Alsup requires the agency to accept not only renewals from DACA beneficiaries whose benefits have expired since the Acting Secretary of Homeland Security's initial September 5, 2017 memorandum terminating the program, but it must also allow renewal applications to be filed by DACA beneficiaries whose status expired no earlier than 16 months and four days ago, on September 5, 2016. It's the debate that Congress has to resolve over the next two days if it wants to avoid a government shutdown: How urgent is a DACA fix, really? How badly does Congress need to pass a bill this month to give 690,000 young unauthorized immigrants (who are already losing their protections under the Deferred Action for Childhood Arrivals program) a shot at permanent legal status? While some Republicans have often pooh-poohed the urgency of a DACA fix, Democrats say the situation is dire. And before this past week, it unequivocally was. But all of a sudden, the original DACA program has been partially resurrected — and its bizarre afterlife complicates the argument over when Congress will need to act. That's partly because of a shocking ruling issued last week by Judge William Alsup, ordering the administration to resurrect part of the DACA program and allow the 690,000 young unauthorized immigrants protected from deportation under the program when the Trump administration started shutting it down in October to apply for renewals of their two-year work permits. But even more than Alsup's ruling, the Trump administration's response has muddied the waters on DACA. The Department of Justice, led by Attorney General Jeff Sessions, is challenging Alsup's ruling in a way that's tactically aggressive but not doing everything they can to get DACA shut down again as quickly as possible. The DOJ's current strategy makes it entirely possible that as of March 5 — the day the Trump administration said expiring DACA permits would no longer be renewable, which has been treated by Congress as the "deadline" for a DACA fix — the federal government will, in fact, still be allowing DACA recipients to renew their work permits. Interestingly, however, Politico reports that as of January 16, DOJ had not sought to have Judge Alsup's injunction stayed. If true, this is likely a shrewd political move, intended to give Congress the opportunity to negotiate a bill that would contain a "DACA fix" along with additional enforcement tools to mitigate the consequences that an amnesty of the 690,000 DACA beneficiaries would cause. Despite the urgent tone ... the administration did not immediately seek a stay of U.S. District Court Judge William Alsup's decision. Instead, last Saturday, the Department of Homeland Security began accepting renewal requests in accordance with the judge's order. In the new filing, Francisco says officials concluded that a stay that the Supreme Court might eventually withdraw and reverse posed too much risk of disruption and confusion. "A primary purpose of the [Homeland Security] Acting Secretary's orderly wind-down of the DACA policy was to avoid the disruptive effects on all parties of abrupt shifts in the enforcement of the Nation's immigration laws," the solicitor general wrote. "Inviting more changes before final resolution of this litigation would not further that interest." I did not appreciate at that time the full scope of USCIS's interpretation of that order, which actually expands the scope of aliens eligible to renew their DACA status. As a practical matter, it could (and likely would) take either of the courts considering that order (the Court of Appeals for the Ninth Circuit and in the Supreme Court) months to issue a decision, well past the original March 5, 2018 deadline. Assume, however, that the Supreme Court stays Judge Alsup's injunction on March 4, 2018. That would leave affected aliens little time to get their affairs in order, even assuming that some action were taken with respect to the renewals granted by USCIS in the interim. The Secretary of Homeland Security (DHS) would therefore likely direct another "wind-down" of DACA, as the then-Acting Secretary did in her September 5, 2017, Memorandum on Rescission Of Deferred Action For Childhood Arrivals. Assuming that that wind-down lasted for six months (a reasonable proposition all things considered), that would mean that in a worst-case scenario for DACA beneficiaries, no alien would be affected until September 2018. I am reluctant to cast aspersions on the press outlets that have overlooked the fairly salient point that as things stand, there is currently no DACA deadline (let alone one looming in the near future), and likely will not be one for some time. I will therefore assume that they simply poorly understand the dynamics of this somewhat complicated issue. But any shutdown of the United States government due to a failure by the Congress to immediately address the status of those individuals would be based on an erroneous premise, that is, that DACA will expire in March, and that action to address the status of those individuals must be done quickly. Should the Democrats decide to shut down the government because the pending continuing resolution does not address the status of DACA beneficiaries, this fact should be made clearly. The question will then become whether the harm that will be done to government employees, pensioners, the national security, and the economy as result of such shutdown was worth the regularization of the status of individuals facing no imminent removal from the United States. I cannot imagine that question being answered in the affirmative.